Tardast, A., Rahimnejad, M., D. Najafpour, G., Asghar Ghoreyshi, A., Zare, H. (2012). Fabrication and Operation of a Novel Membrane-less Microbial Fuel Cell as a Bioelectricity Generator. Iranian Journal of Energy and Environment; previously called: Iranica Journal of Energy & Environment, 3(5), -. Ali Tardast; Mostafa Rahimnejad; Ghasem D. Najafpour; Ali Asghar Ghoreyshi; Hossein Zare. "Fabrication and Operation of a Novel Membrane-less Microbial Fuel Cell as a Bioelectricity Generator". Iranian Journal of Energy and Environment; previously called: Iranica Journal of Energy & Environment, 3, 5, 2012, -. Tardast, A., Rahimnejad, M., D. Najafpour, G., Asghar Ghoreyshi, A., Zare, H. (2012). 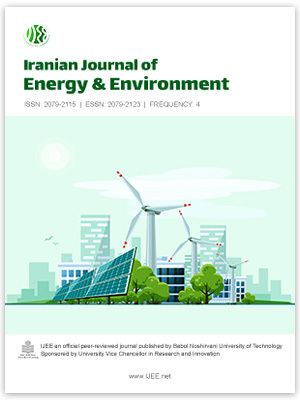 'Fabrication and Operation of a Novel Membrane-less Microbial Fuel Cell as a Bioelectricity Generator', Iranian Journal of Energy and Environment; previously called: Iranica Journal of Energy & Environment, 3(5), pp. -. Tardast, A., Rahimnejad, M., D. Najafpour, G., Asghar Ghoreyshi, A., Zare, H. Fabrication and Operation of a Novel Membrane-less Microbial Fuel Cell as a Bioelectricity Generator. Iranian Journal of Energy and Environment; previously called: Iranica Journal of Energy & Environment, 2012; 3(5): -.